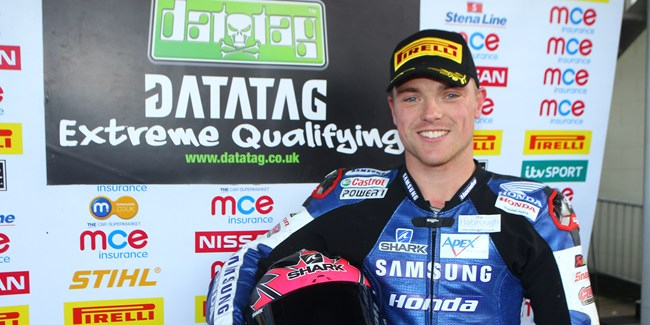 Alex Lowes celebrated his seventh pole position of the MCE Insurance British Superbike Championship season as the Samsung Honda rider scythed under the lap record at Silverstone to claim the top spot in Datatag Extreme Qualifying ahead of a battle-scarred Shane 'Shakey' Byrne. Lowes stormed to the top of the times ahead of Byrne, who waited until the very end of the session to salvage second fastest, despite still suffering from his huge crash this morning in free practice. The front row was completed by American PJ Jacobsen who edged his Tyco Suzuki team-mate Josh Brookes back onto row two to claim his first front row qualifying start. There was more drama for the Title Fighters as Milwaukee Yamaha's James Ellison crashed out on his first flying lap, which puts him on the sixth row of the grid in eighteenth for the opening race tomorrow. Jon Kirkham fired the Buildbase BMW onto the second row in fifth position ahead of Peter Hickman who scored his best qualifying performance of the season in sixth for Lloyds British GBmoto Honda. Matteo Baiocco was another rider to have an impressive performance as he qualified for Q3 for the first time for the Rapido Sport Racing Ducati team, starting seventh for race one ahead of Tommy Bridewell on the leading Milwaukee Yamaha. James Westmoreland and Jakub Smrz completed the top ten.